Oh! have you just deleted an important file by pressing Shift + Del ? Well, don’t get so upset because your file may not have gone forever yet!! Remember, I wrote about some software that are made to securely delete files!! So, Shift + Del is not the ultimate fate of a file. There are software that can restore files from the trace of ‘deleted’ files. PDFZilla recently have released a new product called Free File Undelete that does similar things. 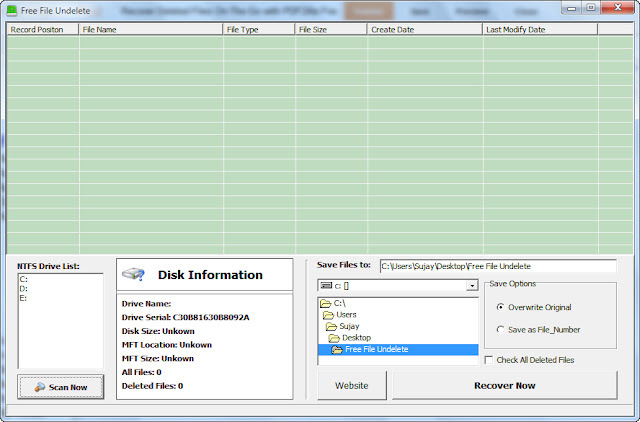 Free File Undelete is a tiny Windows file recovery application that allows users to undelete lost files from their NTFS drives. The program file size is 694KB only, and it is portable so that users can share it via email or flash disk very easily. The software is distributed as a tiny standalone executable [FreeFileUndelete.exe ; 694 Kb]. No installation is needed. Application is launched on executing the executable. Runs well on all Windows version, both 32 and 64 bit. Clean interface. No difficult settings. No offline help documentation, online instruction is enough. 5 – Click “Recover Now” Button. It shows Disk Information of the selected NTFS disk drive. Search for recoverable files is very fast. It shows only files that can be fully recoverable. You can select desired files to be recovered. It has a button to select all in the detected list. File recovery process is also fast. Recovered files are saved in the same folder as the application executable, but that can be changed. By default it overwrite files with similar name in the output folder but it can also be set to rename. At idle time the software consumes negligible resources, while during searching and recovering files, it uses moderate resources. was successful to find and recover all the files that I deleted few days back. I liked this clean and efficient application and will recommend it. It has scopes to improve in some respect. It provides recovery for NTFS drive only. It should also support other popular drive types. It should provide a search tool or filter for finding desired files in a large list of recoverable file. Don’t perform any write operation on a drive where you accidentally deleted file(s) was/were present. Don’t place the output folder in the drive containing the recoverable file. The software is free of any hidden malware as checked on Virustotal. This entry was posted in File Management, Free, OS Enhancement, Portable, Software, Undelete, Windows. I tested it in Windows 7 64 bit. Did you note the cautions. 1. Don't perform any write operation on a drive where you accidentally deleted file(s) was/were present.2. Don't place the output folder in the drive containing the recoverable file.